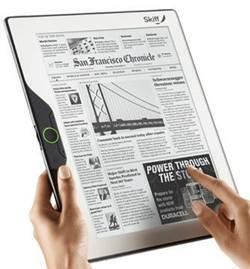 Skiff has announced that its Skiff Reader e-book reader will be preview at CES 2010. According to the company, the Skiff Reader is claimed to be the largest e-book reader with 11.5-inch full touchscreen display with 1200 x 1600 resolutions that suited to magazines and newspapers. The Skiff Reader is just over a quarter-inch thick and features an e-paper display based on a thin and flexible sheet of stainless-steel foil which developed by LG Display. The device weighs just over one pound and lasts over a week of average use between the battery charges. “The Skiff Reader’s big screen will showcase print media in compelling new ways,” said Gilbert Fuchsberg, president of Skiff, LLC. The e-books and subscriptions can be downloaded from Skiff store within the US via Sprint’s 3G wireless connection. The device has been enhanced to display the newspapers and magazines in the original graphic formats. In addition, it is Wi-Fi enabled. The reader is expected to be available in this year and the price of the device is not yet announced.